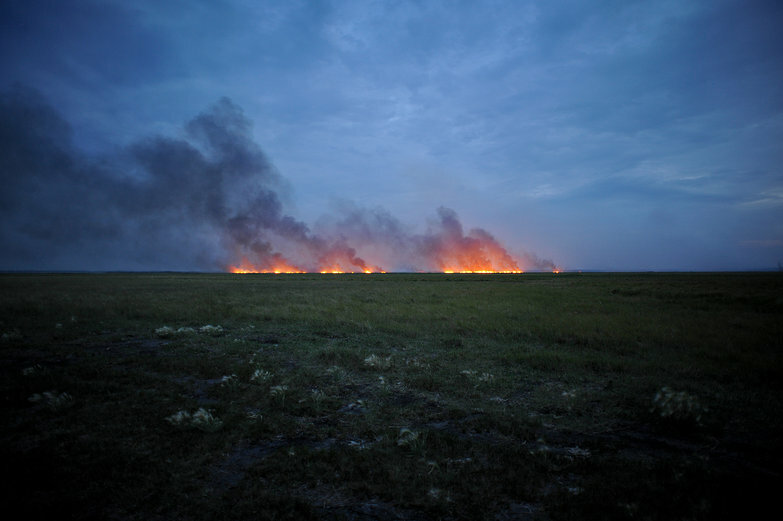 I messed up when publishing our previous entry, Racing Through Russia's Heartland. It is fixed now! 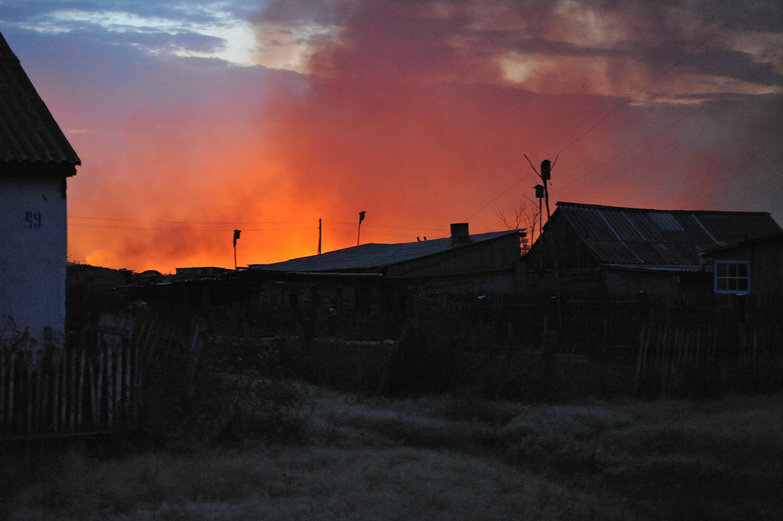 While making our way back to the highway leading into Omsk, we spot a grey plume of smoke in the distance. 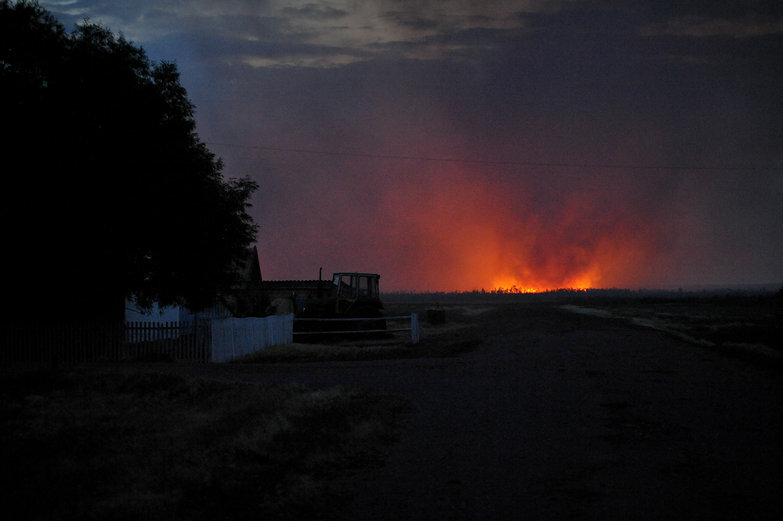 I'm excited, because Russia is covered in forest fires this summer, but we've yet to actually see one. Tara wants to be done for the day, but agrees to a very short exploratory mission. We drive into a field, heading down yet another dirt track. 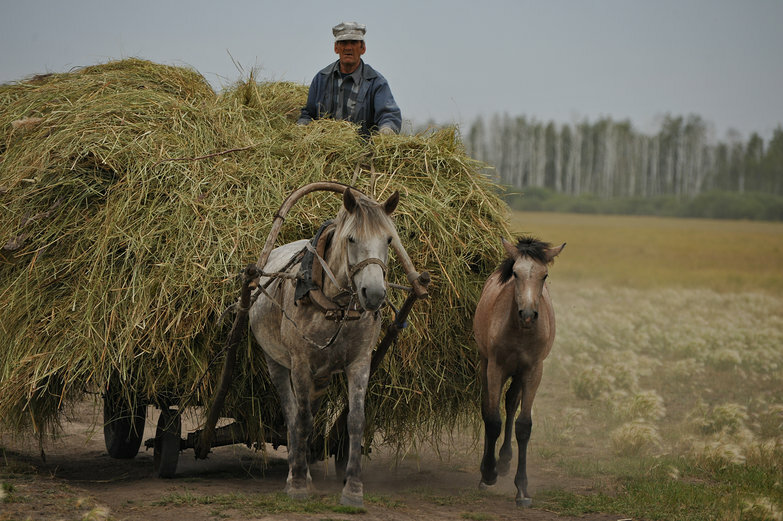 As we wind our way in the general direction of the smoke, a farmer passes us on a rickety wooden cart, hauling a load of hay to a nearby village. A young foal awkwardly gallops alongside, kicking dust into the dry evening air. We stop the car a few kilometers from the flames. The tracks can lead us no closer, so I hop out to investigate. Tara stays with the car, journaling. 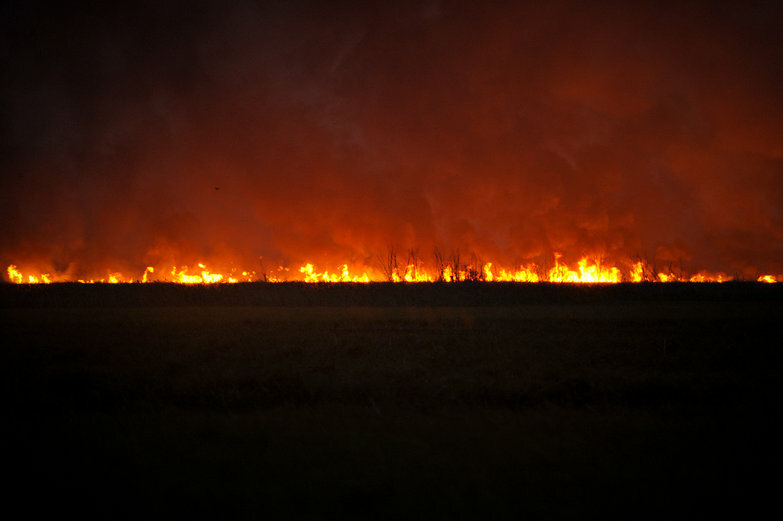 I have our telephoto lens affixed to our camera, and our wide angle in my left hand, excited to get a closer look of the blaze in the fields. I wave to Tara, who says goodbye with a chipper, "Vigilance!" On my way towards the smoke, I stop and introduce myself to a man on horseback, directing a herd of cattle. The Siberian cowboy's name is Aleksandr, but beyond a handshake and a simple exchange of names, our shared language is very limited. With a gold capped, toothy smile, he gives me a nod and returns to his duties. I resume my march. Grassy fields give way to dry, scrubby underbrush, then slowly transition to sticky, muddy ground. Looking out at the orange glow as I trek further from the car, I can't figure out what is actually on fire. 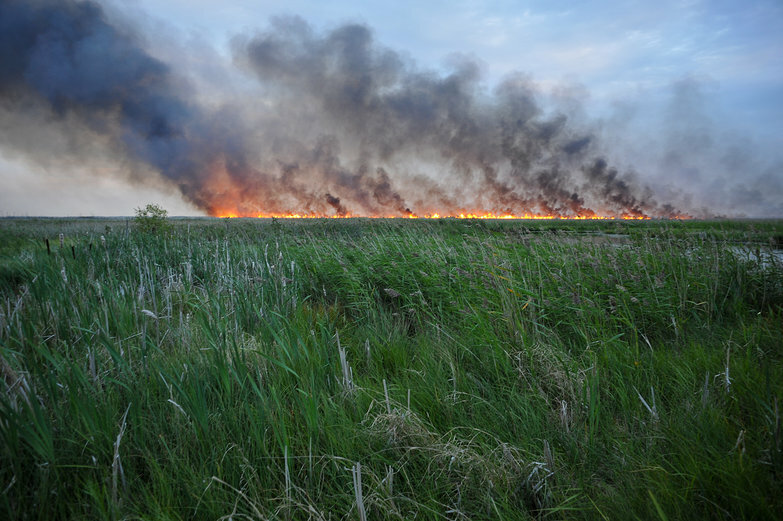 For a moment, I wonder if this is a controlled burn of some kind? 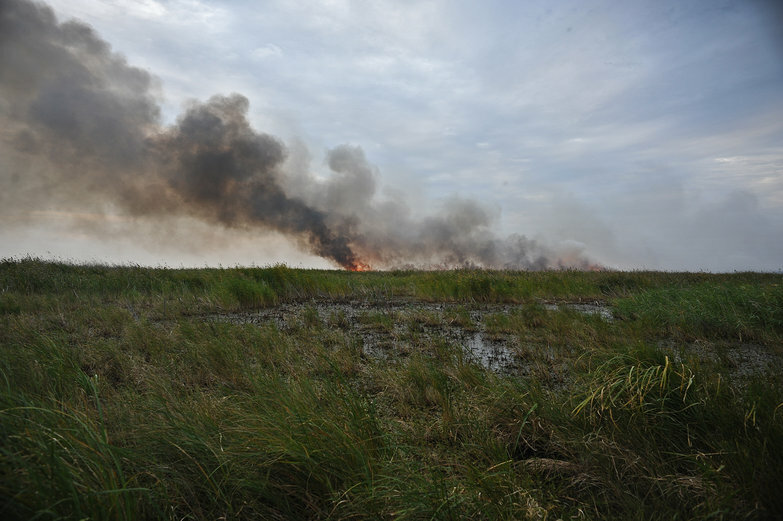 How could a fire start in the middle of what looks to be a swamp? The terrain is becoming boggy when I see a clearing where I think I can get a better vantage point of the fire. I am now ankle deep in mud, but the ground beneath the water is firm – I continue onwards. Next, I reach a line of very tall reeds. The clearing and higher ground I saw should be directly ahead, not too many paces in. 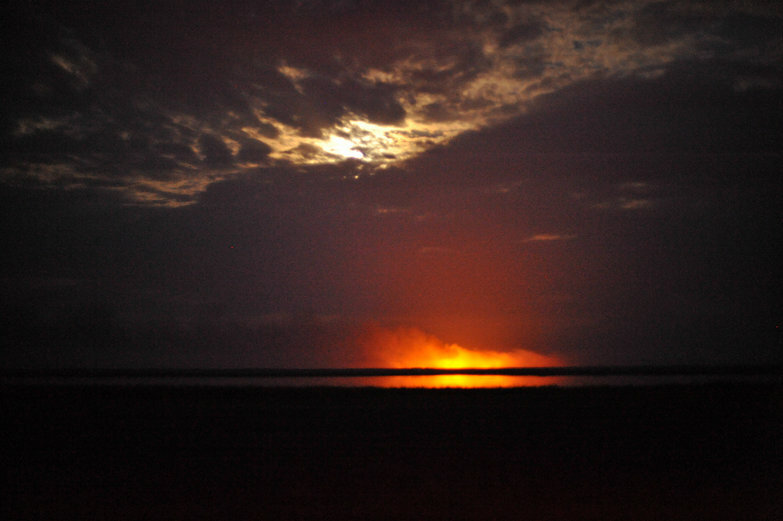 The fire crackles quietly in the distance, the sound barely audible over the mosquitoes buzzing in my ears. As I push through the reeds, listening to the wind and the bugs and the squish of my feet in the muddy water, I begin to regret not having brought my backpack with the field recorder. A few steps more and I've cleared the line of reeds! I take another, and I slip into mud up to my calves. I think to myself that I won't be going much further than this, and I snap a photo for posterity. I decide to push on just a bit further before giving up and turning back. Just a few more cautious steps. Not nearly cautious enough, though – the ground beneath my feet gives way! Suddenly, before I realize what is happening, I am chest deep in marsh. I've instinctively thrown my hands in the air, protecting our camera and lens from dunking beneath grimy surface. My mind is racing. How am I going to get out of this without ruining our camera!? I have nothing to use for leverage, no free hands. I cautiously lift my right leg, slowly and precariously maintaining my balance, trying to find a footing, in front or behind. I almost topple over several times, waving my hands in the air like an unskilled tightrope walker. Somehow, I manage to extract myself from the deep, murky water. My shirt is waterlogged and my rolled-up capris are sagging, ready to unfurl from their newfound weight. I am very shaken; it is time to turn back. Before I go, I extend our telephoto all the way, reach as high into the air as I possibly can, and snap a few shots of the distant fire. I'm not that close to the flames, but the resulting photos scare me a bit. Is the fire moving this way? How fast can a fire move? Probably pretty fast, I think. Suddenly, the entire idea of being out here feels like lunacy. I'm covered in dirt and bog water, possibly endangering my life, and I've nearly ruined our camera. I am ready to be done. I turn back to the reed line, eager to rush home. 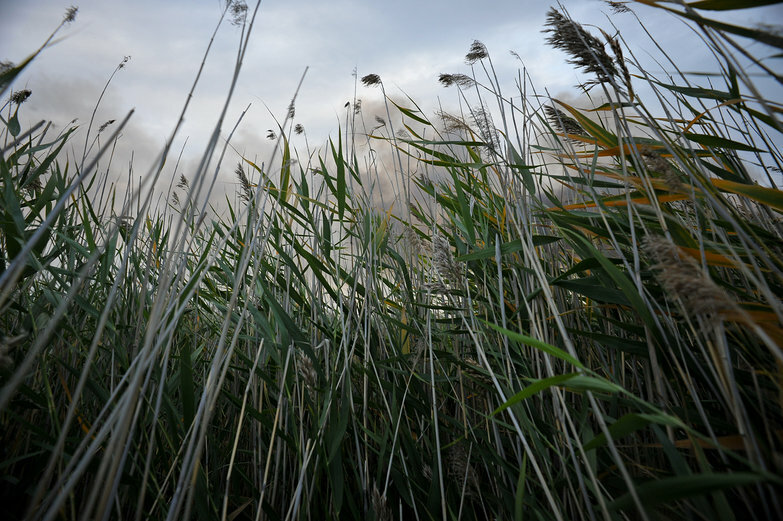 Slogging forward, I can't see a thing; the reeds are several feet taller than me. It only took a few paces to clear them the first time, yet it feels like I've been fighting them for hours. I am very tired. I should be to the edge by now! When I stop to get my bearings, I realize I've gotten turned around somehow. The smoke is on my left, not behind me! 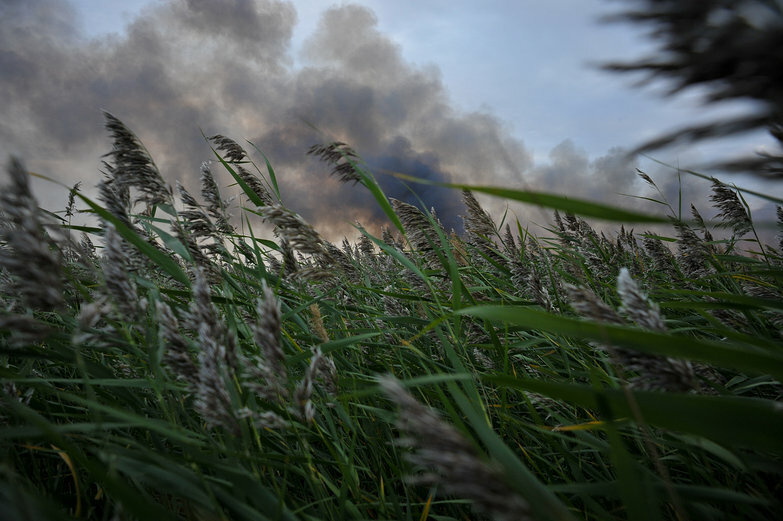 Instead of walking a straight line out, I've been moving parallel to the fire, further into the reeds, and away from the car. Images of getting lost and dying race through my mind as the panic mounts. My heart starts pounding like a jungle drum in my chest, drowning out all sounds with its heavy, rhythmic bass. I'm worried about Tara – what will she think? What will she do? How long have I been gone? I pray she won't try to rescue me and get herself stuck in here too. I'm confused, stupidly worrying about the camera, and hyperventilating as I continue fighting my way through the reeds like a madman. When I get myself turned around again, I almost descend further into a panic spiral. Standing there in the reeds, now completely numb to the mosquitoes devouring me, the mud covering my legs, the scrapes on my hands and arms, I take a deep breath, and finally realize that I'm panicking. With that knowledge comes a sense of calm. Talking to myself I say things like, "Breathe. Calm down. Think rationally. You're not going to die out here for gods sake. Just make some forward progress." 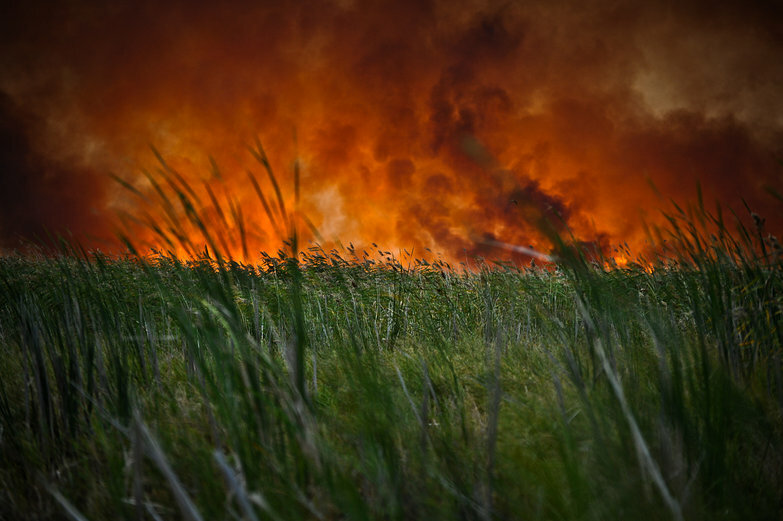 Gasping for air, and exhausted, I orient the fire behind me once more begin a slow march through the reeds, checking my bearings with each stride. God, this swamp is sticky. It is hard to push against these reeds. I can see clearly how I got turned around. I was pushing forward in whatever direction was easiest to bend them. I still have no idea how far it is to the edge, but at least I am in control of my actions again. The swamp is knee-deep everywhere now. I'm frequently flailing to maintain my balance, hands grasping at air and reeds, trying to stabilize myself on the flimsy plants. Stumbling along, feet stuck in the bog, I almost lose my shoes with every step. Realizing I need both hands to stay upright, I try shortening the camera strap so it will hang as close to my neck as possible. I am too shaky to get my fingers to work properly, so I wrap it around my neck twice to keep it high enough. Cringing, I put the second lens in my pocket, hoping it won't be totally destroyed by the water. Calm again, I take one more photo, and push on. When I reach the edge, I am much further afield than the place I entered this mess. Feeling thankful to be in one piece, I hold our camera in the air with the flash on and fire a few shots, hoping Tara will see that I am coming. My mouth is parched. It hurts to swallow. I begin my walk back to the car. I don't want to see the fire; we've had enough adventure for one day. It is getting late and I just want to be done, but I also know that Tyler is really, really interested. So, I acquiesce to a quick visit, and stay in the car as he goes off, anticipating he'll be back shortly. He isn't. He must be really involved, I tell myself. I'm sure he's so engrossed that he's lost track of time. I am annoyed because I want to make camp already, but it's no big deal. Soon a half an hour has come and gone. I start to worry a little, but I know I'm just being silly. While he loves to be right in the action, I know he won't put himself in any danger. As I wait, I watch a man on horseback round up his cattle and his horses, leading them back to town. They are black, silhouetted against a backdrop of pink sky, raging orange flame, and cloudy puffs of purple smoke. I wish we had two cameras; the scene is strikingly intense. I stare in awe, and I wait. The man on horseback slowly makes his way across my field of vision, and before I know it, he is but a speck in the distance. As I've been sitting here, I've watched the fire crawl its way several hundred meters across the fields. And still I wait. Now, I start to worry, with real, wrenching fears and the beginnings of panic, not the normal fretting I felt earlier, and have felt many times before. Where is he? How would I get to him if he were in real trouble? If he somehow caught on fire, there is no way I could get to him in time to do anything about it. I picture his blackened body writhing in pain and I am overwhelmed with fear and horror. I am livid, too – furious that (presuming he's not being consumed alive, now a charred corpse eaten by flame) he has stayed so long. How many fire photos is enough? My mind is racing. How can this be more important than staying in communication with me? We are alone in Siberia. How dare you go off for so long. Do I really have to remind you to NOT GET TOO CLOSE to the fire? To be careful? To not die out here? Still unsure of what to do, I leap out of our LRC and begin tromping through the fields. Realizing that the fire is a lot farther away than it looks, I rush back to the car. Maybe I'll be able to find a dirt track or something? Either way, if anything happened, there is no way I could get there in time. Maybe I could drive to the nearest village to get help? But to do what? I'm sitting in the car, white knuckles gripping the wheel, mad and panicking and unsure of what to do. And then, on the horizon, I see what looks like a black blob coming towards me, ever so slowly. I pray that it is Tyler. It better be Tyler. Squinting, patiently, I wait, and soon the blob takes the form of a man. It has to be him. Eventually I see him clearly and he looks okay. I want to both rush towards him in relief and yell at him for scaring me. He approaches and I see that my fears weren't entirely unfounded. He is soaking wet—maybe the fire did get to him and he put it out with water? He looks like he just got back from war, and he stares at me with huge eyes. I wrap him with a hug, and everything is going to be alright. Darkness falls and the fire burns on. At last I make it back to the car, looking like a drowned rat. My pant legs are hanging around my shoes, we never got around to hemming them (they are always too long, one of the joys of being so short). I am completely and utterly exhausted. I had intended on being gone for twenty minutes at most. I have no idea how long I was lost in those stupid reeds. Tara is freaked out, so I act like everything is fine. I can tell her about what happened later. Driving back through the field, I am feeling very, very mortal. 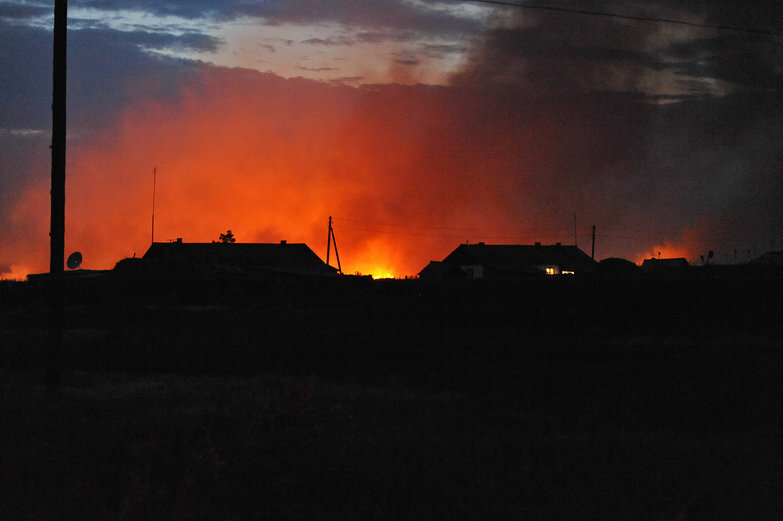 As we leave the village, many of the townspeople are milling about, watching the inferno. It is just a kilometer or two from their homes. It slowly dawns on me that there are no fire hydrants out here. Even if there were, there are no fire fighters to arm them. This really is the back and beyond. We're less than ten kilometers from the the Kazakh border! It seems all these people can do is watch and hope the wind doesn't turn their way. While we talk about what they might do to save their village, Tara recalls a Little House on the Prairie story when Laura Ingalls Wilder and her family burned a line around their home to protect it from a prairie fire. We're struck by the fact people are just standing around, watching. This seems odd to us. We decide we'd probably leave town with what few belongings we cared about, if faced with the same problem. Neither of us knows anything about how to protect one's home from a forest fire. Maybe there is nothing you can do? 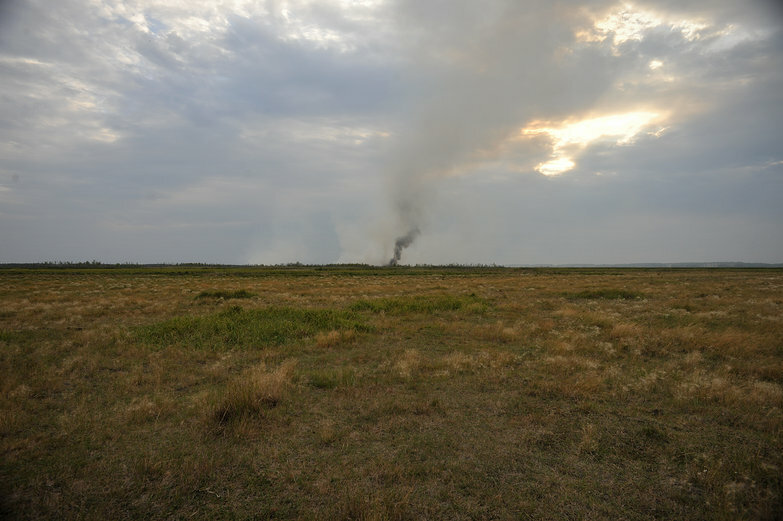 We're not entirely sure how fast a fire can move, so we drive several kilometers away, trying to put some distance between us and the blaze lighting up the horizon. Eventually we find a suitable spot. More than anything, just want be done with this never-ending day. We're starting to make camp, but we can't get stop eying the distant glow. Still unsure if it could reach us in the eight hours we'll be sleeping, we decide to err on the side of caution and drive even further away. Reluctantly and exhaustedly, we put everything back in our car. As we pull on to the rutted roads once more, two marble-sized glowing saucers appear in the distance. They aren't moving. I begin to slow down, unsure what animal we are about to see. 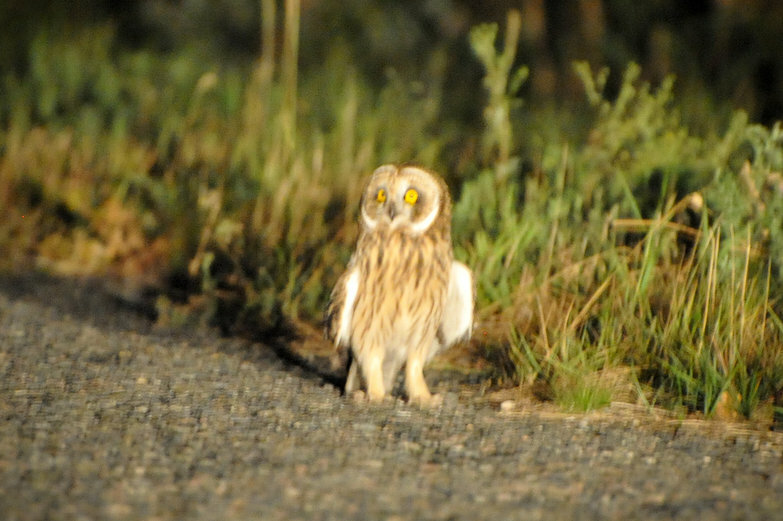 I come to a halt a few meters from the creature, our headlights blanketing it in light. Head swiveling left and right, it seems completely unconcerned about us. When I get out of the car with our camera it still doesn't move. Before I can get a good photo, it spreads its broad wings and flaps heavily into the night. Less than a kilometer later, we spot two deer, loping alongside us. A few meters after that, a fox dashes across the road! A bit more driving and the fire is just a speck in the distance. With a lake and at least two paved or dirt roads between us and it, we feel certain we'll be fine. Like zombies, we perform the nightly tasks we've been doing for the past 500 days and at last our home is made. What a day. 2014 - We Have a Wood-Fired Hot Tub! That really is scary! I'm glad you made it out unharmed! Mon Dieu! How frightening! I'd say this has to rank at the top of your "scariest moments of the trip" file. Thank goodness it turned out OK. What a vivid re-telling. Thanks again for sharing your lives with us. What a scary experience it must have been! Although I knew from the start that it must have ended well, you had me glued to the computer... Keep safe! wow, don't die! you need a longer lens.